FILE- Members of the white supremacist KKK are escorted by police past a large group of protesters during a KKK rally in Charlottesville, Virginia, July 8, 2017. As 21st century activists seek to topple monuments to the 19th century Confederate rebellion, some white Southerners are again advocating for what the Confederates tried and failed to do: secede from the Union. It's not an easy argument to win, and it's not clear how much support the idea has: The leading Southern nationalist group, the Alabama-based League of the South, has been making the same claim for more than two decades and still has an address in the USA, not the CSA. “And that means the South will once again be in name and in actuality White Man's Land. A place where we and our progeny can enjoy Christian liberty and the fruits of our own labor, unhindered by parasitical ‘out groups’” said Hill's message, posted on the group's Facebook page a day after a rally in support of a statue of Confederate Gen. Robert E. Lee in Charlottesville, Virginia. 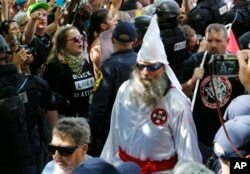 FILE - A KKK white supremacist is escorted by police during a KKK and counter-rally in Charlottesville, Virginia, July 8, 2017. The group has erected billboards that said “SECEDE” in several states, and it even has its own banner - a black and white version of the familiar Confederate battle flag, minus the stars. Secession also finds support on some websites that promote white nationalism, including Occidental Dissent, run by a Hill associate, and the openly racist, anti-Semitic Daily Stormer. Extremist watchdog Heidi Beirich said strict Southern nationalism seems to have been swept up into the larger white-power agenda in recent years. The initiative would form a commission to recommend avenues for California to pursue its independence and delete part of the state constitution that says it's an inseparable part of the United States. The “Calexit” initiative also would instruct the governor and congressional delegation to negotiate more autonomy for California. Thompson's 2012 book “Better Off Without ‘Em: A Northern Manifesto for Southern Secession” argued that both the United States and the South might both be best served if Southern nationalists won the argument and succeeded in forming a new nation.